Mumbai - In IPL T20, Every match was very exciting and till last ball it was very nervous and thrilling. SRH, We know it is having great bowling attack of all teams. They have tried very well to meet low score from mumbai. Finally mumbai scored 157/8 in 20 overs. As we know SRH is having very weak batting and they only depends on dhavan and warner. After that no other batsman will win matches on there own. From last 3-4 years, same thing was happening with SRH. So finally they did scored the target and lost the easy score. 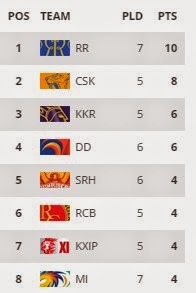 Mumbai won the match and have gone to same position along with other teams except CSK and RR. Now IPL 2015 became very hot, As except CSK and RR, We cannot estimate which will qualify for playoffs. SRH have scored just 137/8 runs and mumbai won by 20 runs and looking forward for coming matches.